March 29 is National Vietnam War Veterans Day, an annual event observed to recognize, honor, and thank the men and women who served in the United States armed forces from November 1, 1955 to May 15, 1975. All who served during this time are considered Vietnam veterans regardless of where they were stationed. Of the approximately 9 Million Vietnam veterans, 2.7 Million were stationed in Vietnam, including 7,484 women. The War was costly: 58,220 were returned to their loved ones in flag-draped caskets; 304,000 were wounded; 75,000 severely disabled and 23,214 were 100% disabled. 766 were POWs (114 of whom died in captivity); and, 1,597 are still unaccounted for, or Missing in Action. Many of those who survived the War returned with deep, invisible, and often permanent wounds from the scars of battle, and exposure to the toxic defoliant, Agent Orange. As a result, the casualty count tragically continues to increase as we lose over 340 Vietnam veterans each and every day, many from war-related causes. Unlike the veterans of previous wars who were welcomed home with great fanfare, Vietnam veterans received no formal welcome or recognition of their service. Because of the bitter controversy surrounding the War, soldiers were often shamed, disgraced, and harassed by anti-war protestors and others. Decades later, Vietnam veterans have finally gained the admiration, respect, and support of millions of Americans who treat the veterans with the dignity they earned, and deserve. No longer rejected, the veterans are embraced and thanked for their bravery and sacrifice. To date, over 11,000 organizations have partnered with the Vietnam War Commemoration Committee to produce over 15,000 ceremonies nationwide. 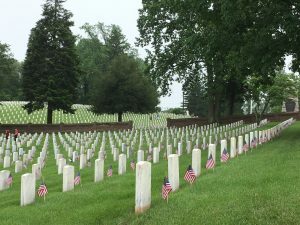 Culpeper National Cemetery is one of the partners in this endeavor and you are cordially invited to attend a Commemoration in Culpeper National Cemetery, 304 US Avenue, Culpeper, Virginia on Friday, March 29th at 12:00 Noon. For additional information, please call 540-825-0027, or visit www.vietnamwar50th.com.